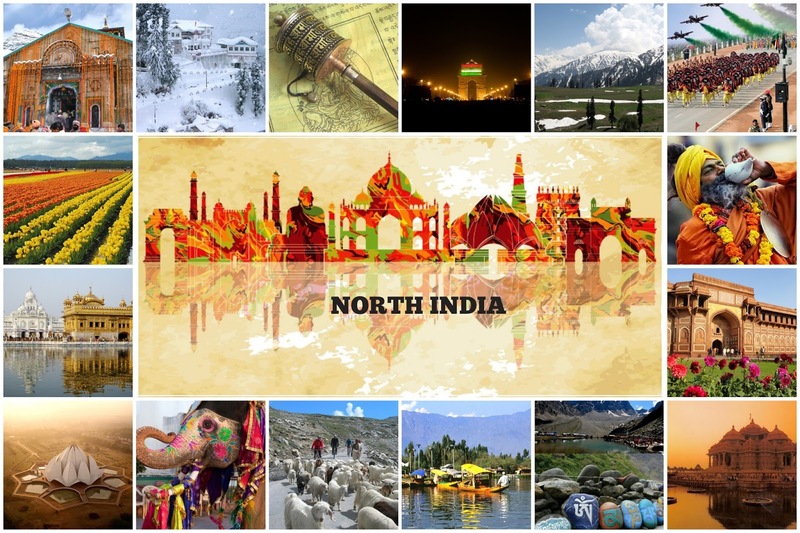 North India has always been the preferred place of destination for all travelers whether it is domestic or overseas. The historical monuments, the mystic hill stations, dense jungles and the vibrant cities in North India showcase the vibrant and modern India. North India offers the wide range of landscapes for tourists during their vacations. From the lush green fields, to the Himalayas and the sultry desert, you will get all in North India. However, you will miss the golden and the white sand beaches, but there are enough to make up for it. Northern India has several tourist destinations like the capital city of Delhi, hill stations of Shimla, Nainital and Mussourie, desert cities of Jaipur, Udaipur and Jodhpur and the erstwhile Mughal Empire at Agra. In Northern India, you are sure to witness three distinct and conflicting cultures. At Agra you will experience the history of the Mughal Empire, in Delhi you will witness the rich heritage of both the Mughal and the British Raj while in the desert state of Rajasthan you will be lost in the glorious past of the warrior clan of the Rajputs, who fought valiantly against the British and the Mughal Empire. What is common in all these cities is the fact that they boasts of some of the brilliant architectural marvels in the country. Since ages, these cities have continued to attract tourists and tour operators big and small are now offering different Northern India tour package that will leave a long lasting impression in your mind. International and domestic tour operators are offering all sorts of plans for North India tour package. From budget plans to indulgence in the lap of luxury, you will get all sorts of tour package that will perfectly fit your pocket. The best part of North India tour package is that you don’t need to travel much. This allows you ample time in your hand so that you can take your time to explore each and every aspect of these historical places and enrich your knowledge about the changing facets of this country. The best time to visit here is winter as the sultry summer will be too much for you to enjoy your vacation. The winter chill will not only allow you to enjoy the desert but will also help you enjoy the snow in the Himalayas. For overseas travelers, it is always advisable for them to book their northern India tour package with international operators or through registered operators of India’s tourism ministry. For domestic travelers, they will be spoilt with choices and will have a tough time to make a selection for their north India tour package. This part of India will surely mesmerize you and will always force you to come back the next time.